There’s new polling out from TNS-BMRB into the form of wording for the Scottish Independence referendum due to take place in October 2014. The firm effectively carried out four separate polls of Scottish voters putting different wording to each. Do you think that Scotland should be an independent country? Do you think that Scotland should be an independent country or do you think that it should remain part of the United Kingdom? Do you think that Scotland should remain part of the United Kingdom or do you think that it should be an independent country? 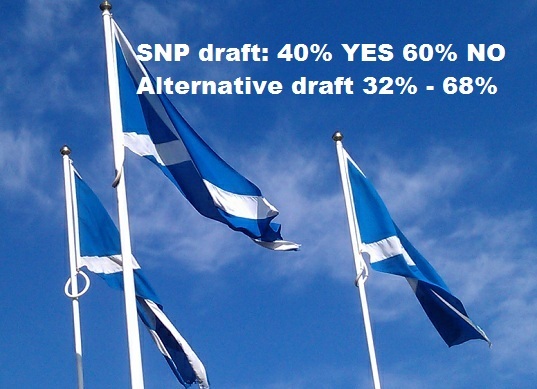 This polling comes out on the day the NO campaign is being launched. Its head, Alistair Darling, picks up the fear factor with a warning that there is â€œno way backâ€ if the country votes YES.